Attorney General, Hon.Kaiyum inspects cyclone affected areas and helps out with the distribution of relief supplies. Residents severely affected by Tropical Cyclone Winston in the north-west of VitiLevu have received desperately needed relief supplies during a three day tour of the region by the Attorney-General, Hon Aiyaz Sayed-Khaiyum. The AG fanned out across a wide area with two other Government ministers – the Minister for Women, Children and Poverty Alleviation. Hon. Rosy Akbar, and the Minister for Local Government, Housing and Environment, Infrastructure and Transport, Hon Parveen Kumar. They distributed a large portion of the 10,000 food packs that have been donated to the cyclone relief effort by two of Fiji’s biggest companies – CJ Patel and Punja and Sons. They also began the distribution of a large number of kitchen utensils donated by R.C Manubhai. The AG’s tour took in cyclone-ravaged areas of Raviravi, Karavi and Yalalevu, (Ba) on Friday, Korobuya, Nabutini, Busabusa and Veisaru (Ba) and Korovou (Tavua) on Saturday, and Nadhari, and Navia (Ba) on Sunday. In addition, Minister Akbar visitedMaruru, Yalalevu, Clopcott ,Nukulua, Vatuvui and Sarava. And Minister Kumar visited Veisaru, Veitiyaka, Qerelevu, Nakavika, Nabatolu, Itatoko, Korovutu and Navoli. 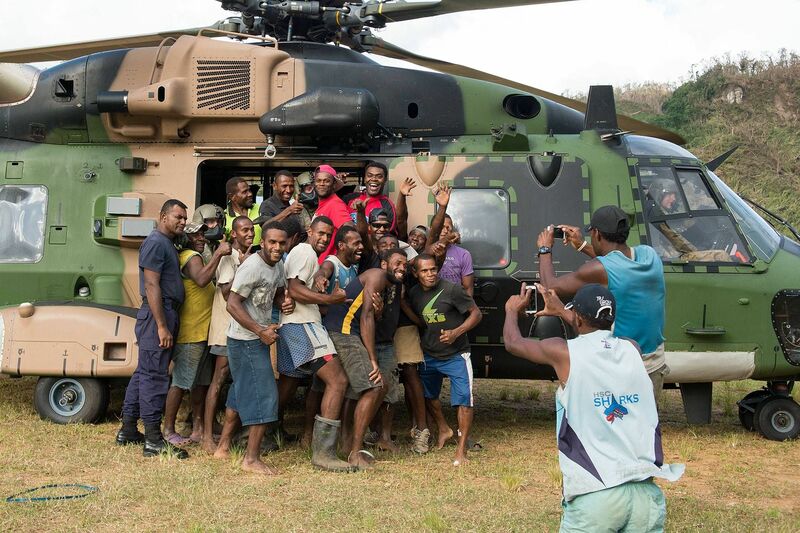 It was the first time many of those affected by Cyclone Winston had received any form of assistance since it cut a swathe through the region a week ago. And residents expressed their relief and thanks to the AG and the two other Minsters. An emotional Teja Singh, who is a 71-year-old farmer in the Raviravi area of Ba, said he had lost all his belongings in the cyclone and was very grateful to have finally received some assistance. “No-one has visited us until now and I am very happy to see you”, he told the AG, “ I have lived here all my life but have nothing left. All my possessions are gone and my sugar cane has been damaged. We desperately need help so thank you for coming with this food”, he said. Another resident, Naushad Ali, said that of all the cyclones in his lifetime, Winston was the worst.“ It is the first time that I have seen a cyclone cause so much damage. Everything is still wet and our things are ruined. Please help us,” he pleaded. Vijayanti Mala also warmly thanked the AG for the assistance he had brought and said it meant a great deal to her and her family. “Our roof blew away and nothing much is left. We all desperately need help. My son is getting married soon but my kitchen has been damaged. How am I going to prepare for the wedding?”, she asked. The AG said all Fijians must stay united as the relief effort continues and help each other through the challenge of the coming weeks and months. “ It is critical that we all come together as a nation at this time. It is the only way we are going to put this tragedy behind us quickly. 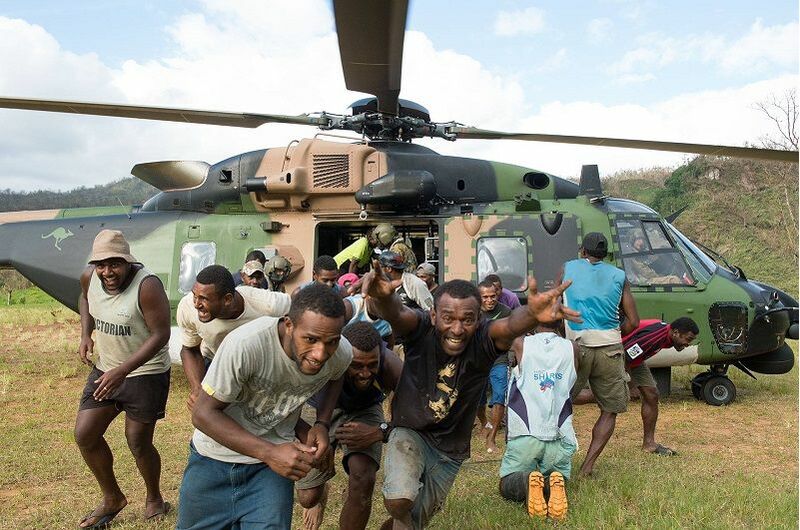 Many of the people we were able to help are Fijians who had fallen through the cracks of the relief effort so far. We have to keep improving the delivery of food water and adequate shelter. We cannot leave anyone behind. So I appeal to everyone to highlight areas of acute need so that the Government can step in and provide prompt assistance”, he said. CJ Patel has donated 5000 food packs valued at $232,000 and Punja and Sons another 5000 valued at $129,000 to assist the relief effort. R.C Manubhai have donated kitchen utensils to the value of $15,000 and mattresses and roofing supplies worth another $20,000. The AG warmly thanked all three companies for their contribution to alleviating the plight of cyclone victims. “Fijian companies are responding magnificently to our call for assistance and I want to pay tribute to CJ Patel,Punja and Sons, R.C Manubhai and all those other companies who are being exemplary corporate citizens by supporting their fellow Fijians in this crisis”, he said. Newly established spa and beauty facility, the Essence of Fiji Rejuvenation Centre in Nadi, is now accepting local and overseas students for the 2015 courses at their spa and beauty school, Spa Academy. Courses are conducted in English. Hostel accommodation is located adjacent to school. 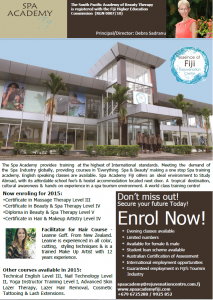 The South Pacific Acacemy of Beauty Theraphy, the main body of the Acacemy, is registered with the Fiji Higher Education Commission. The first couses begins in February 2015. For registration and query, contact spaacademy@rejuvenationcentre.com.fj. The Bainimarama Government has finalised a decree that greatly expands access to coverage of important televised events, including sports, by requiring all of Fiji’s free-to-air television broadcasters to air them. These events include the following: the FIFA World Cup; the Rugby World Cup, both Sevens and Fifteens; the Rugby League World Cup; the IRB Sevens Series; the Netball World Cup; the Olympic Games; the Commonwealth Games; the South Pacific Games; the Mini-South Pacific Games; the Coca-Cola Games; state funerals; general elections results; the national budget address; and parliament proceedings (questions and answers sessions). The Attorney-General and Minister for Communications, Aiyaz Sayed-Khaiyum, said that the Television (Cross-Carriage of Designated Events) Decree 2014 puts an end to the old system that allowed a single broadcaster to purchase exclusive rights for the coverage of important events. “Many Fijians – especially amongst the poor and marginalised – do not have access to subscription television or even to all three free-to-air television stations. They might only receive one or two stations depending on where they live or what kind of antenna they have,” the Attorney-General explained. The Attorney-General said that the Bainimarama Government does not want those who cannot afford a subscription television service like SKY or who do not have access to all of the free-to-air channels to miss out on important programming. 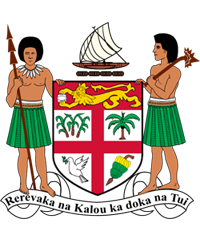 “This new law ends discrimination between viewers and ensures that more Fijians will be able to watch all these important events,” he said. “Under the new law, everybody who has access to at least one free-to-air station – FBC, Fiji TV or Mai TV – will now be able to view coverage of the designated events,” he said. The Attorney-General said the law will apply to all different kinds of programming, but that the biggest impact will be on boosting the coverage of major sporting events. “The Bainimarama Government understands how much ordinary Fijians care about sports and we are pleased that this new law will give coverage of top sporting events to many people who have never had it before,” he said. He explained that under the Decree free-to-air television broadcasters must share the cost of the rights to the designated events. The amount each has to pay is in direct proportion to its share of the market. “We will be buying the rights to these events as a nation, rather than as individual companies. This means that all Fijians now have a right to see all these events,” he said. “Countries such as Australia, India, and Singapore have similar legislation, which has proven to be an effective way to maintain fair market conduct and effective competition in their broadcast industries, as well as to ensure the availability of a comprehensive range of quality television services,” he said. The Attorney-General said that the market share of each of Fiji’s free-to-air television stations has been based on an independent viewership and listenership survey conducted by Clarus Research Group, an internationally-respected survey research firm based in Washington, D.C. 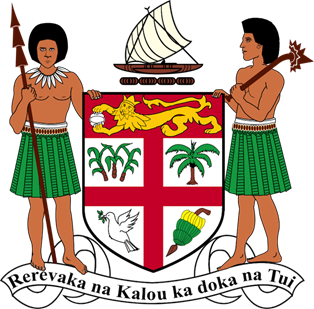 The survey will be made public and posted on Fijian Government’s website – www.fiji.gov.fj – and the Department of Communication’s website – www.communications.gov.fj.